THE 2018 wHYALLA UNEARTH FESTIVAL HAS ONCE AGAIN GAINED SUPER VALUABLE SUPPORT FROM LOCAL BUSINESSES IN wHYALLA. The Whyalla uneARTh Festival is not only a sensational splash of music, arts, activities and atmosphere … it is also a community event the city can be rightfully proud of. There were many contributors that came together to make last year’s inaugural event such an award-winning success and they will do the same for the 2018 Whyalla uneARTh Festival. Some of those contributors include a list of valued sponsors. Most of these sponsors are local businesses emphasising the community aspect of this event which is put on free for the public. It is the support of these businesses that goes a long way to ensuring this event is world-class when it comes to the entertainment, organisation and promotion. “We started this event last year to bring to Whyalla top-quality entertainment and a world-class event,” Council Tourism and Events Officer and festival organiser Rebecca Neilson said. “As a council in a regional centre, we feel it is our responsibility to provide a level of entertainment and events that wouldn’t normally make their way out to these areas. “The support of business and corporate sponsors is vital for an event that has free entry, is put on the benefit of the community and to attract people into the city to further boost our economy. The sponsors start with the City of Whyalla which organises the event and puts not only real money into the festival but also hundreds of hours of person-power with its staff from the organisers to works crews on the day. 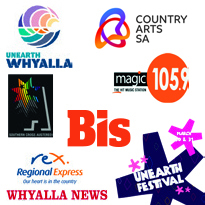 The local media plays a big part with radio station MagicFM, newspaper Whyalla News and television station Southern Cross TV all based here in Whyalla and combining to support the local event. These companies come together in a bipartisan approach to provide vital media coverage across multiple platforms. BIS was also on board last year with sponsorship and the local mining services company has once again put its hand up to support this year’s event with an even more generous package. BIS is a mining services company that provides logistics, materials handling, specialist underground equipment and consulting services to resources companies across Australia and Indonesia. You’ll see the BIS brand around the festival as the sponsor of our work crew shirts with a very generous injection of funds and services adding to the support. Many of the acts coming to the 2018 Whyalla uneARTh Festival are coming from Adelaide and that’s where valuable sponsorship has come into play with Regional Express. As Whyalla major domestic carrier, REX has provided a generous sponsorship package which includes some much-appreciated flights for some of our headlining acts. Country Arts SA has been a major contributor to the festival with its expertise and a healthy amount of event funding. Country Arts SA has a long association with Whyalla including the provision of an arts and culture office in cooperation with the City of Whyalla. Of course, the Adelaide Fringe Festival is also a major contributor to the event. Whyalla uneARTh Festival gets valuable support and many acts from the Adelaide festival’s organisers to give Whyalla uneARTh the brilliant, unique Fringe vibe and vitality. The City of Whyalla thanks these sponsors and encourages everyone in Whyalla and every visitor to our town to patronise these businesses where they can. These are local businesses supporting local endeavours and we salute them.